The 5045E, 5055E, 5065E, and 5075E Utility Tractors meet U.S. Environmental Protection Agency (EPA) Final Tier 4 (FT4) exhaust emissions regulations with a diesel oxidation catalyst (DOC)/diesel particulate filter (DPF) system. Modifying the after-treatment device resulted in better forward and side visibility around the hood. The hood slope of the updated design is comparable to the Tier 2 tractors previously produced. Similar to the system on the 5M, the purpose of the DOC/DPF combination is to reduce toxic gases emitted from the exhaust, as well as to filter particulate matter to prevent it from becoming airborne. As the tractor continues to operate over time, as is the case with any filter, the DPF will accumulate particulate matter and will need to be cleaned. It is cleaned through a process called regeneration. During a regeneration cycle, exhaust temperatures increase to burn off the excess particulate matter. 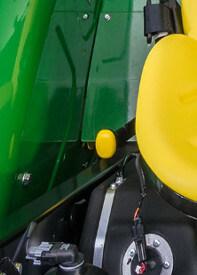 On a John Deere 5 Series Tractor equipped with a DOC/DPF, the operator does not need to provide any input to trigger the regeneration process. On the dash is an exhaust filter cleaning switch. 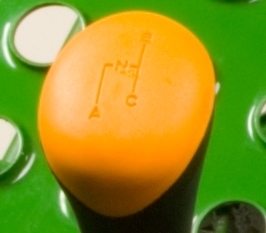 As long as this switch remains in the auto position, the tractor is in full control of the regeneration process and will regenerate on an as-needed basis during operation. The operator just continues to operate the tractor as normal while the regeneration process takes place. There may be times a tractor is operating in an environment not suitable for a regeneration cycle, such as in a confined area or during service. For this reason, the bottom section of the exhaust filter cleaning switch can be depressed to disable the regeneration. The disable position allows the operator to temporarily inhibit the regeneration cycle. The operator should return the switch to auto mode as soon as possible to avoid continued soot buildup in the exhaust filter, which can lead to a parked regeneration. John Deere does not recommend disabling the automatic exhaust filter cleaning unless it is absolutely necessary. The simplicity and intuitiveness of the exhaust filter cleaning switch maximizes uptime by minimizing the operator’s input into the regeneration process. This increases the overall productivity of the tractor by reducing the chances of a parked regeneration. The operator-friendly interface allows the operator to easily complete the task at hand, even during the regeneration process. Operator comfort is important regardless of the application. Improving the 5E 3-Cylinder Tractor models, the hand throttle has been relocated to the right-hand console. This is 30.5 cm (12-in.) closer to the operator and within easy reach versus the previous location on the center-hand console. Operators may also notice the additional legroom provided by the repositioned loader controls, providing a more enjoyable experience. 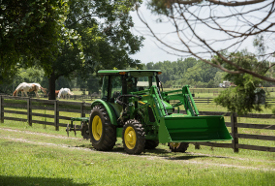 The 540 economy PTO option comes in base equipment with the 12F/12R PowrReverser™ transmission. The 540/540 economy PTO allows operators to select the engine rpm for reduced fuel consumption, reduced noise levels, reduced vibration, and less wear and tear on the engine, while at the same time keeping the proper 540 rpm at the PTO. The economy PTO provides 540 rpm to the PTO at 1600 engine rpm. The 540 economy mode is ideal for any PTO application, from running a mower-conditioner to a baler or a cutter, where full engine horsepower is not required. Operating at lower engine rpm decreases fuel costs up to 30 percent and provides additional productivity by improving the operating experience through enhanced operator comfort from reduced noise and vibration. 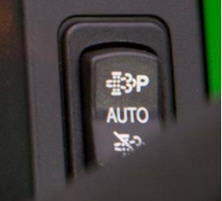 A lever allows the operator to simply change between 540 and 540E when conditions merit the opportunity to save fuel without affecting performance. For heavy-duty operations requiring maximum PTO power, the PTO shift lever is placed in the 540 position, the PTO is engaged, and the engine is run at a rated speed of 2100 rpm. This selection gives 540 rpm to the PTO shaft and delivers the fully advertised horsepower at rated engine speed. When the cab tractor is in economy PTO mode, the engine is electronically limited to 1600 rpm, preventing accidental over speeding of PTO implements and protecting against binding the PTO shaft. This interlock also prevents accidental shifting of the PTO selector lever at engine speeds above 1600 rpm, which would lead to downtime for fixing implements or drivetrain components. 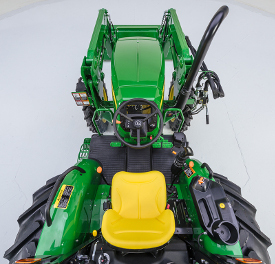 The John Deere-built PowrReverser transmission provides 12 forward and 12 reverse gears for operators requiring additional flexibility for multiple applications. It comes standard with shiftable 540/540 Economy power take-off (PTO) and electronically activated, telescoping draft links. This transmission is ideal for operators using their tractors to perform in versatile applications. Hydraulic wet forward and reverse clutches maximize durability and will outlast the life of any dry clutch. When tractors are run by multiple operators with a variety of experience levels, a wet clutch is the best way to maintain transmission integrity and performance while decreasing clutch replacement costs. The gear lever selects one of four speeds, all synchronized shifts for on-the-go shifting with the use of the clutch. The range lever selects collar-shift A, B, and C ranges, which are not synchronized. Maximum productivity is achieved with hydraulic PowerShift between forward and reverse and is ideal for loader and rear-blade applications that require frequent directional switches in tight spaces. Excellent modulation allows the operator to shift the direction lever from neutral to forward or reverse, forward to reverse, reverse to forward, or to neutral from forward or reverse. Operators can accomplish all these directional changes without sacrificing comfort or having to depress the clutch pedal. The speed of directional changes can be adjusted to the operator's preference or application demands with the field-installed infinitely-variable control kit. 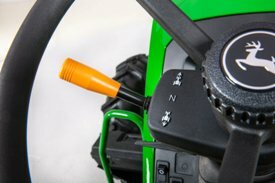 The PowrReverser transmission also allows the operator to steer and shift direction with the left hand, freeing the right hand to operate other tractor controls, such as the loader, rear implements, or hand throttle. Constant-mesh, helical-cut gears provide quieter operation and excellent reliability while the pressure-lubricated top shaft adds to the transmission durability. Fully enclosed, rigid shift linkages for short throw and crisp shifts enable all operators to clearly know in what range and gear they are operating. Positive park pawl on the transmission provides positive park and eliminates the need for a hand brake. This also eliminates clutch service costs that occur when the park brake is accidentally left engaged. 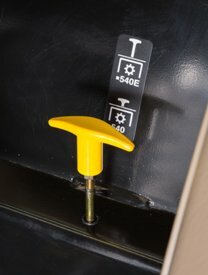 A neutral start switch requires the directional lever to be in the neutral position to start the engine. 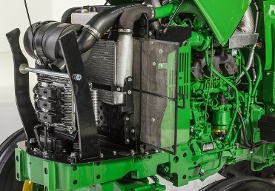 The SyncShuttle transmission is designed to match the excellent power and torque characteristics of the John Deere PowerTech™ engines. Transmission durability is enhanced with the pressure-lubricated top shaft, allowing an operator to achieve performance from one working season to the next. Additionally, this in-base transmission is configured with fixed draft links, single-speed power take-off (PTO) and mechanical PTO engagement. The transmission is characterized as full top shaft synchronized (TSS) when forward shifting on-the-go between speeds, and is characterized a synchronized while depressing the clutch. Nine forward and three reverse (9F/3R) speeds are achieved by using two platform-mounted levers for shift operation. The gear lever at the operator's right hand selects one of three forward gears and one reverse gear, as well as the integrated park position. The range lever at the operator's left hand selects collar-shift A, B, and C ranges. 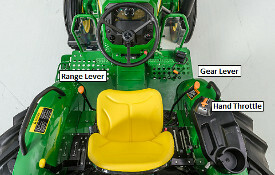 Operators can easily switch directions without having to completely stop the tractor with synchronized, in-line, shuttle-shift capability between forward and reverse gears on the gear-shift lever in all three ranges (A, B, and C ranges). 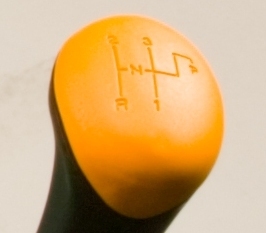 A neutral start switch requires the gear-shift lever be in the neutral or park positions to start the engine. A positive park pawl on the transmission provides positive park and eliminates the need for a hand brake. This also eliminates clutch service costs that occur when the park brake is accidentally left engaged. Limited-slip, heavy-duty MFWD front axle will provide operators with increased drawbar pull and improved traction when operating in slippery conditions. 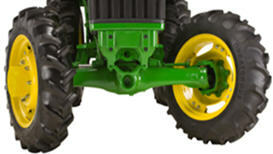 This ensures the operator gets the required torque to the ground for applications that demand more from the tractor. 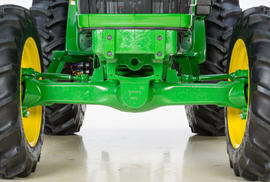 The MFWD front axle also reduces wheel slippage with less tractor ballasting for reduced soil compaction, increased fuel economy, and longer tire life. The MFWD centerline design provides excellent maneuverability around the worksite and more crop clearance so producers aren't driving down their crop or profits. Additional versatility is proven when wheel treads are adjusted with 6 degrees of caster angle and a 55-degree turn angle, which results in a turning radius as short as 3 m (9.9 ft) (brakes applied), allowing plenty of horsepower to turn around in tight places. 10 degrees of axle oscillation follows uneven terrain, allowing for consistent performance and comfortable ride. Axle oscillation also reduces the stress and maintenance cost on the axle spindles because loads are consistently spread across the entire axle. The centerline design eliminates the need for drive shaft universal joints that require regular maintenance. Anti-wrap shielding on the driveline is standard to prevent crop material and debris from building around the driveline and ensures tractor performance. Three grease points are conveniently located to minimize maintenance time while maximizing front axle performance. NOTE: The MFWD engagement lever is located on the left-hand side of the operator's seat. 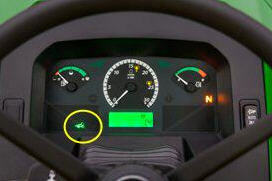 For the operator’s convenience, when MFWD is engaged, an indicator light will appear on the dash.